From sports bars to tiny traditional bacari to nightclubs to the only bar in Venice that specializes in craft beer, you can really find any kind of nightlife you like in Cannaregio. On the Strada Nova you'll find dance clubs, sports bars and bacari frequented almost entirely by out-of-towners, while one street away, on the Fondamenta della Misericordia, you can mingle with locals and enjoy wine or beer at a table by a canal, sometimes with a band playing from a boat tied off just outside the bar. 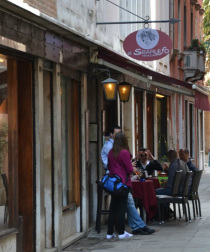 El Sbarlefo, Calle Pistor, Cannaregio, Near Campo Santi Apostoli. Aldo, 2710 Cannaregio on the Fondamenta Ormensini. Sure, you can get a beer in any bar in town, and even a Guinness in some of the pubs, but Aldo is the only bar in Venice that actually specializes in beer. They have an incredible variety of speciality beers from around the world both in bottles and on tap. 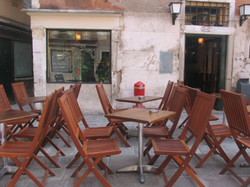 The place itself is a low-key establishment with a couple of outdoor tables on the Rio Della Misericordia, a large bar, and a window to the street for easy service. Overall, a great spot with a relaxed feel and certainly the ONLY place to go in Venice if you're very particular about your pint. Irish Pub, 3847 Cannaregio, In Corte Dei Pali Gia Testor, Just off the Strada Nova. The Irish Pub just might be the perfect mix of Venice & pub. They've got great outdoor seating in a little square just off the Strada Nova and a warm, woody interior with lots of beer on tap. Irish Pub hosts a lot of events including live music, parties and of course provides space for viewing sporting events. It's a laid back and homey place to stop into for a pint. Frulala, Cannaregio on the Strada Nova & Near Rialto in Campiello Riccardo Selvatico. "Lions by Day, Panthers by Night." 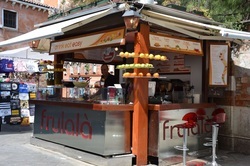 The Frulala bars springing up around Venice are another business run in conjunction with the cultural association that strives to bring some healthy, fun and modern life into the streets of Venice. By day, Frulala is a juice bar. By night, they are cocktail bars playing modern music and mixed yummy fruity drinks and sangria. Frulala employs Venetian students at good pay and reasonable hours in an effort to create job opportunities and a positive working environment for young people in Venice. 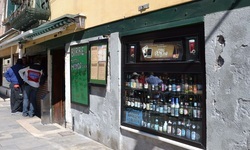 Milan Bar, 5990 Cannaregio, In Campo San Canzian. 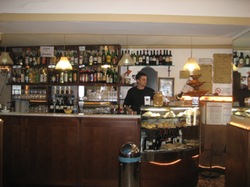 Despite it's proximity to the major tourist attractions at Campo San Giovanni e Paolo and Campo Santi Apostoli, the Milan bar is long on local color and short on fellow tourists. The bar has a large indoor area, including an upstairs and a back room with video games, and a decent amount of outdoor seating. It is a favorite with neighborhood residents for a relaxed spritz time. Many patrons of Milan Bar have big personalities. Don't be surprised if life becomes a musical and someone bursts into song.